When it comes to personal care, we tend to be particularly picky, and once we have found a skilled individual we trust, we usually stay very loyal - no miles incentive needed. People are willing to drive to another city for the annual check-up with their family doctor, or, as in my case, plan a dentist appointment for when they visit the old home overseas. But there are some things that just can't wait, and with the photo session for my new passport imminent, I found myself in need of a haircut. 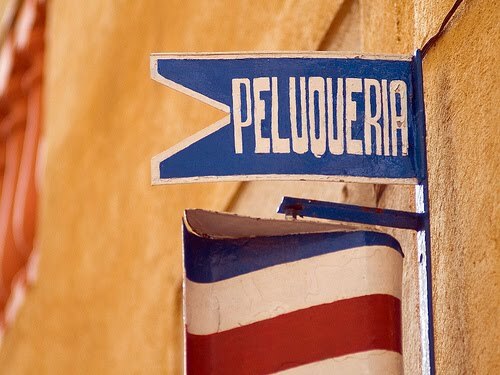 Finding a barbershop is not difficult: The galeria de tiendas next to our Santiago office counts at least a dozen of them. Walking past them, though, I became a victim of choice overload: Should I opt for the dimly lit discount store? The young and hip salon with the girls in heels and skirts? Or the chain franchise that also offers nail care and, gulp, waxing? As I was roaming the alleys, I ran into a Kiwi and a German workmate, both of whom have been living in Chile for many years. Over a beer, I introduced them to my dilemma. They were not helpful. "Do you know that all it takes to become a barber in this country is to pick up a pair of scissors?" said one. "I'd wait until I was back in Canada" added the other. And had I ever thought about keeping my hair in braids? Ah, how good it is to get local scoop. 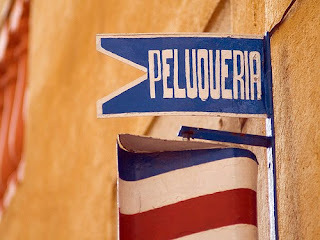 Slightly annoyed, and emboldened by the caña, I got up and walked straight into the next best barber's, where I was welcomed by a friendly and seemingly down-to-earth woman. As she directed me to a rather basic stool, I could not help but notice that she was pregnant. I took it as a good omen, since she clearly had enough returning customers to give her the confidence of starting a family. And then came the question I had dreaded: ¿Cómo cortamos? Short, was my answer, in both senses of the word, for the elaborate vocabulary of a Spanish figaro was far beyond my capabilities. But the scissors-wielding lady acknowledged with a smile, and started chopping away. Only minutes later, a substantial amount of hair had migrated from my head down into my shirt, and a mirror was put behind my head to showcase the craftsmanship applied. It left no doubt: This was very much a corte! As I tipped my new hairdresser, it occured to me that her child will almost be a teenager by the time her masterpiece will expire along with my new passport. And no matter how short she cut, by then I will be wishing to have this much hair left!